Lauren Elligsen of Echo blocks a shot onto her side of the net during the match against South Wasco on Friday afternoon. ECHO - The 2-4 Big Sky 1A East Echo Cougars hosted the 3-3 Big Sky 1A West South Wasco Redsides in a volleyball match on Friday afternoon. Echo won the first and fourth sets, 25-18 and 25-20. South Wasco won the second and third sets 25-20 and 25-18. This set up a deciding first to 15 fifth set. 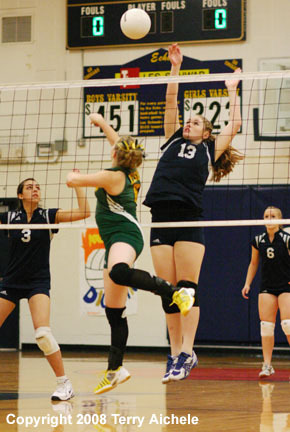 The fifth set had the Cougars slumping slightly leading to a Redsides 15-6 win. It was senior day at the volleyball match with Ashley Hodgen, Ashley Gregerson, Sydney Swaggart, and Mariah McQuown being given recognition by their parents and friends. The Cougars came out firing on all cylinders in the first set. The teams were tied at 2-2, 4-4 and 5-5. After that Echo gained better shot control and maintained service for longer stretches than South Wasco. At one point Mariah McQuown went on a seven point serving streak taking the Cougars out to a 18-7 lead. Echo limited their mistakes and set up their shots to control the first game. The Cougars came out flat at the start of the second set not scoring their point until a sideout at 1-5. Shilah Hilliard took the serve when the Cougars were down 1-7 racking up 7 points to take a 8-7 lead from the Redsides. Momentum swung back and forth until the teams were tied at 16-16. From that point on South Wasco pulled ahead slightly and took the 25-20 win. South Wasco took control of the third set after the Cougars stalled at a 6-3 lead. Sydney Swaggart, Ryanne Tarvin and Kirsten McCallum had nice kills in the middle of set forcing sideouts to Echo, but the Cougars couldn't capitalize on those opportunities. South Wasco took the third set 25-18. Echo knew they had to get something going in the fourth set. They took a 4-0 lead before the first sideout to the Redsides. Kirsten McCallum hit several kills and Lauren Elligsen scored offensive blocks to help the Cougars take a 13-4 lead. The Redsides looked a little disorganized as they missed sets and spikes. The Resides improved in the second half of the set serving a couple of aces. Big blocks and kills by Cougars including Elizabeth Ferge, Taylor Tarvin, and Lauren Elligsen shut down the Redsides momentum. The Cougars took the fourth set 25-20. 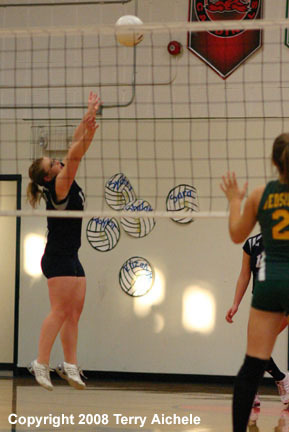 The fifth and final set had the teams playing pretty evenly until the Redside had a 9-6 lead. Even with some awesome volleys to keep the points going the Cougars couldn't overcome the Redsides drive to score. The Redsides took the deciding set 15-6. 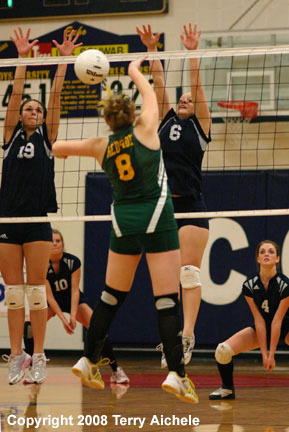 LEFT -Kirsten McCallum, of Echo, with an offensive block in the first set. 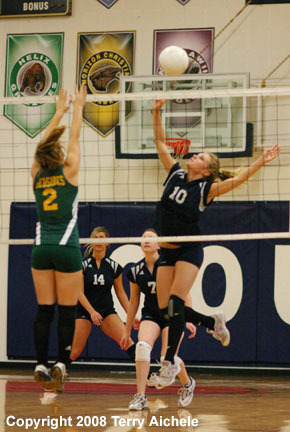 RIGHT - Ryanne Tarvin, of Echo, with an offensive block in the first set. 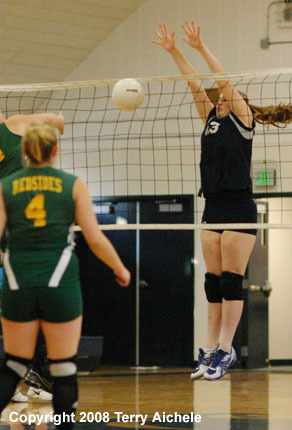 LEFT - Chelsey Alsup of South Wasco points at the volleyball as it bounces off to the side out of bounds. 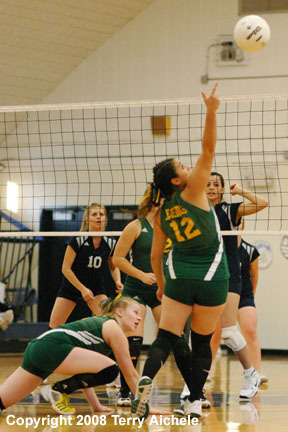 RIGHT - Sara Reese of Echo bumps a shot during the match against South Wasco of Friday afternoon. 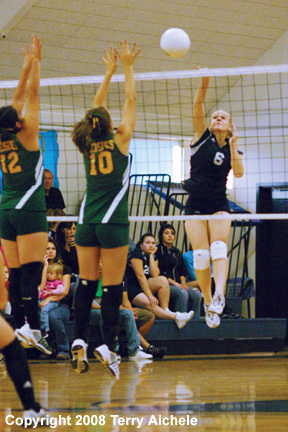 LEFT - Sydney Swaggart of Echo tips the ball over over the net. 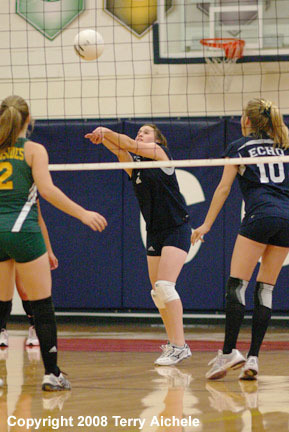 RIGHT - Mariah McQuown of Echo sets the volleyball. LEFT - Like a modern dance Megan Ferrell of South Wasco and Lauren Elligsen of Echo battle at the net. 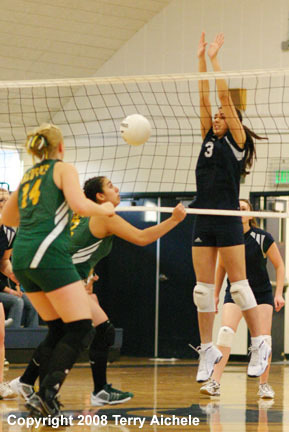 RIGHT - Elizabeth Ferge in the far court spikes the ball against Chelsey Alsup and Brittany Pierce of South Wasco. 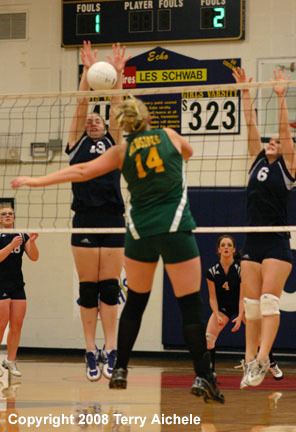 LEFT - Kirsten McCallum of Echo spikes a shot against a South Wasco player. 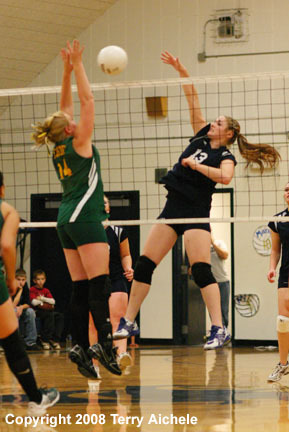 RIGHT - Elizabeth Ferge of Ferge hits a shot during the game on Friday. 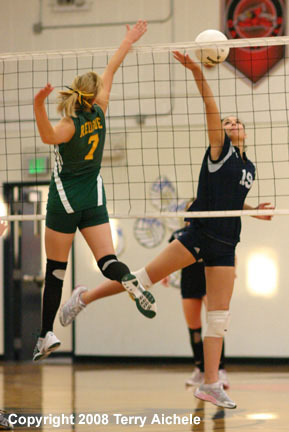 LEFT - Ryanne Tarvin of Echo blasts a spike against Cassie Killam of South Wasco. RIGHT - Kirsten McCallum in the far court hits a shot towards Cassie Killam of South Wasco. 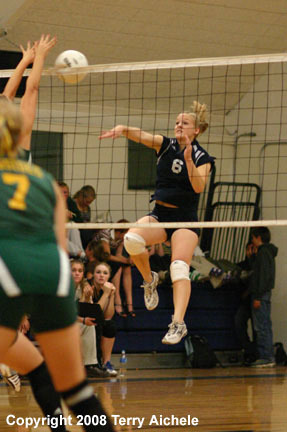 LEFT - Elizabeth Ferge hits a spike while in mid leap during the match against South Wasco on Friday night. 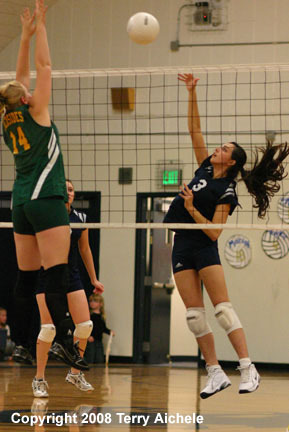 RIGHT - Kirsten McCallum on the left appears to be attempting an offensive block on a hit by Cassie Killam of South Wasco. Lindee Burgett of South Wasco hits a shot at Lauren Elligsen of Echo during the match on Friday.